What is peace? What is tranquility? Is it a path through a forest? Is it a moment of shared love? Is it a kind deed? I think every person longs to experience peace and tranquility in his or her life. Many find a path to that state through religious practice. After all, there is something comforting in ritual. When I took the bus up to Mount Koya, I was looking for a tranquil forest, a place to experience the essence of Shingon Buddhism, a place to walk. In fact, I didn’t plan on writing about the town of Koyasan itself. I was just going to take pictures and create a slideshow of the natural surroundings. But when I went to the tourist information center and told Hitomi what my plans were, she said that I would need to go to the main temple to get permission to take pictures for publication. So, I headed to Kongobi-ji Head Temple. There I met Takua Kamei, a monk who is the manager of International Affairs Section at the Kongbuji Head Temple. He took me to back office conference room, and I explained what I was doing with the blog. He asked me to fill out some paper work and gave me a pass and free entrance to the temple. Takua was very gracious and helpful to me as I began to explore Koyasan. He loves his town as well as its spiritual history. Before I started my trek through the Koyasan complex, though, I spent a few minutes talking with Takua. He’s not just a monk here. He’s a native of Koyasan. He grew up here. As a monk, this holy place that was founded by Kobo Daishi Kukai (the father of Shingon Esoteric Buddhism) is the spiritual center of Takua’s world. As a local, this town is a tight-knit community filled with men and women that he has known for most of his life. 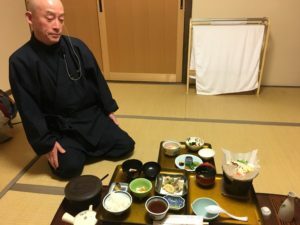 Takua explained that Koyasan has lost a lot of people over the past fifty years. What was a population of 10,000 is now one of about 3,500, and that worries him. Takua hopes that more people move to Koyasan permanently to further revitalize its economy. As a monk, he hopes all people come to hear the story of Kobo Daishi, who is said to be in eternal meditation, and discover the tremendous beauty that exists in each and everyone of them. Purity is a big part of Shingon Buddhism. Just as water is a baptismal element in Christianity, the Buddhists use water to cleanse themselves at special pools. But water is not the only element of importance. In the video below, you will see a lot of images of the gorinton, the five elements of earth, water, fire, wind, and space, in Okuno-in, the massive graveyard located in a pine forest. I’ve mentioned in posts before that I love graveyards, and I have been in many all over the world. But I have never seen anything like Okuno-in before. There are over 200,000 grave markers that stretch throughout the forest. The path through Okuno-in leads to Okuno-in Kobodaishi Gobyo, the holiest site and location where Kobo Daishi’s mausoleum. There’s so much more I could say about the various holy sites throughout Koyasan (Kongobuji, Konpon Daito, Kondo, Tokugawake Reidai, etc. ), but I want to return to the essence of the place and the people who live there. There are the people who manage the coffee shops and restaurants, who work in the pharmacy or at the hospital, the teachers who works at the schools, and the bus and taxi drivers who ferry people up and down the mountain. And, of course, there are the monks. I saw many working on cleaning pathways or graves in the forest, some praying, some managing temple sites by selling souvenirs or answering questions. Steve is an initiate who is considering the ascetic life of a Shingon Buddhist monk. But the people who are drawn to this life are seeking something more than a day job in the tourism trade. Takua told me that I should visit Sekisho-in temple because there was a young monk from the U.S. there. 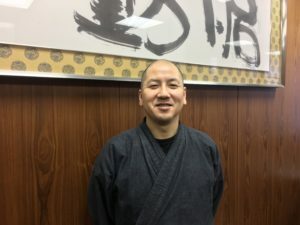 I never met Daniel, but I did meet Steve from New Jersey, an initiate who is is in training also at Sekisho-in. Steve’s been there for five months now. The path that led him to the place is an interesting one. He was a commercial fisherman in Alaska who went to Hawaii for a vacation during the off-season. “A lot of the fishermen go to Hawaii for a few months,” he explained. When he was in Hawaii, Steve saw a lot of Japanese people and was intrigued. So, he left Hawaii and came to Japan. At first, he was just hitchhiking across Japan. Somewhere along the way, Steve ended up in Shokuku and participated in the 88 pilgrimage. That introduction to Shingon Buddhism led him to Koyasan. I asked him how long he intended to stay. He said that he didn’t know. He told me that Daniel has been there for many years and is now fluent in Japanese. One of the primary jobs that occupy the monks and probably the biggest draw for tourists are the managing of the temples themselves. People go to Koyasan to stay with the monks, to gain a glimpse into their ascetic lives, to meditate with them, to practice Shakyo (the writing of sutras) with them, to eat their food, and to sleep like them. I stayed at the Fukuchi-in temple, and it was certainly an interesting experience. In a lot of ways, it felt like a hotel experience with some amenities tied specifically to the monkish experience. Of course, the more you chose to do, the higher the bill. I did do the dinner, a vegetarian meal that was quite good. Matsuoka is a monk at the Fukuchi-in temple who explained the dishes the comprised the dinner I was served. Matsuoka was the monk who brought me my meal and explained each dish to me. He is a very nice man, eager to help and to converse. The question that I had for him involved the cold. I haven’t mentioned it as of yet, but let me assure you that the cold was an ever-present figure in my stay in Koyasan. I haven’t experienced that kind of cold since my night in the bothy in the Cairngorms or that morning on Culloden Battlefield. The temples are cold because the doors and windows are open during the day. You literally could hang meat in them, and it would be just fine. 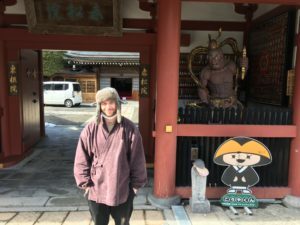 I asked Matsuoka how on earth he tolerated it because it looked like he was wearing a very limited amount of clothing, the standard garb of the monk. He revealed that he was actually wearing four layers of clothes, and then he laughed and admitted that he had a heater in his room as well. They also have the hot baths and sauna, locations I quickly took advantage of when I returned from my forest walk in Okuno-in. Still, I wondered about all of the pilgrims and monks who had come to Koyasan centuries before, who had lived their ascetic lives in those brutal winters when the snow piled in the forest shade and caused even the stone statues to shiver. To come to such a place of beauty and wonder but also to expose one’s self to such brutal conditions at the same time seems to me to be the essence of faith itself, a transcendent trial of sorts. When I awoke the next morning, I knew that I had not experienced all that I could have in my short time in Koyasan. Like so many of the tourists, Takua had mentioned in our conversation I was dipping my proverbial toe and then leaving the town and her people to entertain, amuse, and perhaps enlighten the next batch heading up the winding mountain road. Hitomi is a native of Koyasan who loves her town and helps visitors navigate its wonders. But before I left, I went back to the tourist information center (here’s the link). 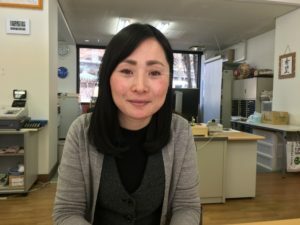 I had a question about the bus routes and times, but, more truthfully, I wanted to say goodbye to Hitomi, the woman who had helped me the day before. Like Takua, Hitomi is a native of Koyasan. Like many, she left, but then she chose to return. I asked her what she loved about her home. Like Takua, she said the people. Just to give you an idea, there were 54 students in her class when she graduated from school. I thought about what Takua had said about how many people left because they wanted to give their kids access to larger, perhaps more affluent, schools, and I asked Hitomi if she would want to raise a family in Koyasan. Takua described the Buddha within as a seed. I viewed Hitomi’s answer as a seed as well, a possible future of a little town surrounded by shrines and mausoleums but full of living people. Like the trees that encompass it and are so central to Buddhism itself, Koyasan’s roots run deep into the earth, and her petals promise to blossom with each coming spring. Until my next post, keep looking to the heavens and seeking your own star.